The repeat broadcast of Dolly Parton's Coat Of Many Colors on NBC the night of Christmas Day brought a fraction of viewers that the made-for-TV movie had seen, given the notoriously low television viewership on the nation's most popular holiday. The first hour of the film saw 3.473 million viewers and a 0.7 rating with those age 18-49, increasing to 4.5 million viewers for the second hour and a 0.8 rating, giving it an evening average of 3.99 million viewers and a 0.8 rating. Its 0.8 ranked as the night's second-largest rating (tied with The Andy Griffith Christmas Special at 8 p.m. on CBS and 20/20 at 10 p.m. on ABC) behind CMA Country Christmas on ABC, hosted by Coat star Jennifer Nettles, with a 1.1 rating. For total audience, Dolly's movie was fifth behind Andy Griffith's 5.19 million, a Blue Bloods repeat at 10 p.m. with 5.08 million, CMA Country Christmas with 4.8 million, and a 9 p.m. repeat of Blue Bloods with 4.16 million. The project's original broadcast earlier this month saw 13 million watch the live showing and 2.6 million DVR viewers in the first three days afterward, an all-time record for a made-for-TV movie and a total of 15.6 million viewers making it the most-watched movie broadcast on the big four networks in nearly six years, a period during which they showed a total of about 275 films with smaller audiences. Dolly has shared a second conversation about one of her songs with the Nashville Songwriters Association International via The Tennessean: this time "I Will Always Love You." Previously, she discussed "Coat Of Many Colors." Read more here. Dolly's Blue Smoke dips one spot again to No. 3 in the album's 81st week on the British country compilations albums chart, the charts released Friday noted. On the same tally, Dolly's The Tour Collection rises five to No. 9 while Emmylou Harris' Original Album Series, Volume 1 (with two Dolly covers, one track with Dolly harmony and one track with Trio harmony by Dolly and Linda Ronstadt) inches up one to No. 19. NBC on Christmas Day night repeated the hugely successful Dolly Parton's Coat Of Many Colors, which saw 15.6 million viewers in the "live+3" ratings (original broadcast plus first three days of DVR viewing), and Zap 2 It interviewed star Jennifer Nettles, who said here that it was cathartic to play Dolly's mother in the made-for-TV movie. Public Good on Wednesday released a holiday video of Dolly saying her Christmas wish this year is to find an O blood type kidney donor for her friend and attorney Jerry Edelstein. Watch the video here or in the media player above. Universal Pictures has announced that Dolly's 1982 film with Burt Reynolds, The Best Little Whorehouse In Texas, is getting its first BluRay release on March 8. It will feature the same special features as the DVD release: a making-of featurette, the theatrical trailer and outtakes. Reserve your copy here! Once Upon A Christmas by Kenny Rogers and Dolly just keeps moving on up. The Jan. 2 Billboard charts have it re-entering the album sales tally at No. 99 for a 20th week, holding steady at No. 129 Hot 200 albums in its 30th week there, No. 31 Canadian albums and No. 4 country catalog albums in its 105th week there. The CD rises two to No. 27 catalog albums in its 25th week there and four to No. 26 top holiday albums for a 54th chart week there. Its track "Hard Candy Christmas" by Dolly inches up one on the holiday digital songs sales chart to No. 46. Country Faith Christmas, featuring Dolly's 1990 recording of "Joy To The World," falls eight to No. 31 country albums in its sixth week, also coming in at No. 15 Christian albums, No. 16 Christian and gospel albums and No. 16 compilation albums. Rhonda Vincent's holiday collection, Christmas Time, with Dolly and several other guests on "The Twelve Days Of Christmas," moves up three to No. 2 bluegrass albums in its seventh week, re-entering the heatseekers albums list at No. 18 and Christian albums chart at No. 48. Jewel's Picking Up The Pieces, with Dolly on "My Father's Daughter," falls off the folk albums chart, down from No. 20 in its 12th week. In its 21st week, Don Henley's Cass County, which features Dolly on "When I Stop Dreaming," rebounds 30 to No. 107 top 200, 16 to No. 55 current albums, 28 to No. 68 album sales, and one to No. 11 country albums. 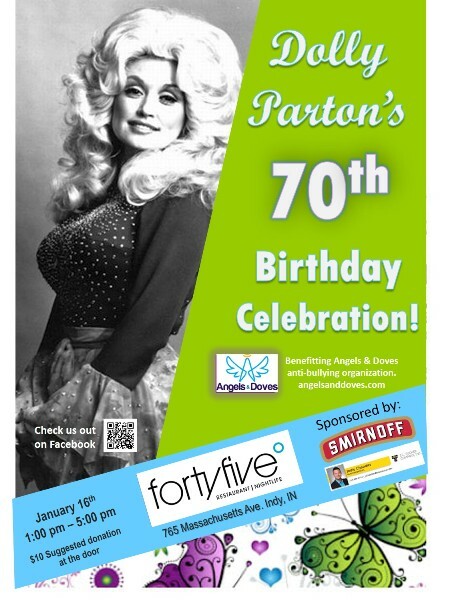 Another community is giving Dolly a 70th birthday party. Seattle's Chop Suey will celebrate her special day a day late on Jan. 20 with a night of Dolly music from local entertainers, according to The Stranger here. Just days before its rebroadcast on NBC on Christmas Day night, Dolly Parton's Coat Of Many Colors was released Monday for digital download at a $10 purchase price via Amazon.com here and iTunes here. Dolly's Blue Smoke rises one to No. 2 in the album's 80th week on the British country compilations albums chart, Friday's charts showed. On the same tally, Dolly's The Tour Collection gains five to No. 14, while Emmylou Harris' Original Album Series, Volume 1 (with two Dolly covers, one track with Dolly harmony and one track with Trio harmony by Dolly and Linda Ronstadt) loses three to No. 20. NBC's Today over the weekend got into the 35th anniversary spirit for Dolly's 9 To 5, sharing a 1980 interview with the cast here. Knoxville musicians will be ringing in Dolly's 70th birthday in January with a special tribute concert at the Bijou Theatre, WBIR reports here. Proceeds from the Jan. 19 concert of local musicians (but not Dolly), which also feature clips and home movies from Dolly's early years courtesy the state Archive of Moving Image and Sound at the Knox County Public Library, will benefit the Knox County affiliate of Dolly's Imagination Library literacy project. The governor of Maryland has announced a plan to expand the existing chapter of Dolly's Imagination Library in the city of Baltimore in partnership with the state government as an attempt to reach more children in the city to help get them ready for kindergarten. Check out a story from The Washington Post here. It was previously reported here that the viewers who watched Dolly Parton's Coat Of Many Colors on their DVRs in the first three days after the movie's original broadcast on NBC brought it up to 15.6 million total viewers, and on Thursday industry observers revealed that the 2.548 million who saw it after-the-fact was the largest-ever DVR audience for any film ever broadcast on network television. The additional viewers now make it the most-watched movie on television since 2009's Jesse Stone: Thin Ice brought in 16.018 million people more than six years ago. A whopping 275 theatrical movies, made-for-tv movies and direct-to-video films have aired on the Big Four networks since then. Coverage included The Wrap here and Broadway World here. Also, Dolly on Thursday responded via a press release to NBC's announcement that the network will re-broadcast the movie on Christmas Day night in place of its previously-scheduled programming, saying: "I hoped to bring some families together so they could sit and watch a move like this. I really wanted to celebrate the people, my whole family, who made me who and what I am today. I'm so blessed and thankful for everyone who watched and I hope this story reaches many, many more when NBC shows it Christmas night." Dolly's Dixie Stampede and Dollywood on Thursday made a combined $500,000 donation to push the Pigeon Forge Boys and Girls Club capital campaign past its $2 million goal to make the club's new facility a reality. The announcement was made at the facility's groundbreaking. Read more in a press release here. YouTube channel Hot Music Charts on Thursday released a 10-minute video looking back at all of Dolly's Hot 100 and Bubbling Under pop chart singles of her career. Take a listen here or in the media player below. Because of its massive ratings, NBC on Wednesday announced the network will pre-empt its scheduled programming the night of Christmas Day to re-broadcast Dolly Parton's Coat Of Many Colors at 9 p.m. Eastern. NBC had originally planned a two-hour episode of news program Dateline in that time slot. It will be a country night all around, as FOX provides American Country Countdown's Top 10 Stories of 2015 and ABC offers a repeat of this year's CMA Country Christmas (coincidentally hosted by Coat star Jennifer Nettles). Also, The Hollywood Reporter noted here that the final "live-plus-three" figures (the 13.03 million viewers who watched it live and an additional 2.6 million who DVRed the film and watched it sometime over the following three days) raised its audience to 15.6 million and increased its 18-49 rating from a 1.8 to a 2.5, meaning it had 2.5 percent of all viewers in that age group watching it. Dollywood has announced an 8:30 p.m. fireworks show for New Year's Eve on the park grounds. The park will be open 11 a.m. to 9 p.m. that day and remains open daily except Christmas Eve and Christmas Day from now through Jan. 3. It was 35 years ago this week that Dolly's first film 9 To 5 premiered, and People magazine on Tuesday took a look back with 15 reasons why we still love the movie. Check out the list here. Once Upon A Christmas, Dolly's 1984 holiday album with Kenny Rogers, just keeps selling more copies the closer it gets to the holiday, the Dec. 26 Billboard charts on Tuesday showed. The CD rises three to No. 4 in its 104th chart week on the country catalog albums chart, six spots to No. 31 Canadian albums, four places to No. 29 catalog albums in its 24th week there, 23 spaces to No. 129 all-genre Hot 200 albums in its 29th week there, also re-entering the top holiday albums tally at No. 30 for a 53rd chart week there. Its track "Hard Candy Christmas" by Dolly inches down one on the holiday digital songs sales chart to No. 47. Country Faith Christmas, featuring Dolly's 1990 recording of "Joy To The World," rises one to No. 23 country albums in its fifth week, also coming in at No. 12 Christian albums, No. 13 Christian and gospel albums and No. 15 compilation albums. Rhonda Vincent's holiday collection, Christmas Time, with Dolly and several other guests on "The Twelve Days Of Christmas," slips two to No. 5 bluegrass albums in its sixth week. Jewel's Picking Up The Pieces, with Dolly on "My Father's Daughter," falls six on the folk albums chart to No. 20 in its 12th week. In its 20th week, Don Henley's Cass County, which features Dolly on "When I Stop Dreaming," loses 38 to No. 137 top 200, 12 to No. 71 current albums, 19 to No. 96 album sales, and one to No. 12 country albums. Dollywood is among the theme parks competing for USA Today's next top 10 list: best theme park holiday event. At press time, the park's Smoky Mountain Christmas was No. 2 behind sister park Silver Dollar City's An Old Time Christmas. Vote for Dollywood here. Mentor Blake Shelton and The Voice finalist Emily Ann Roberts tried their hand Monday night at Kenny & Dolly's "Islands In The Stream." NBC must have thought the line "making love with each other" to be too risqu� because they changed it throughout the song to "cause we love one another." Watch the duet on YouTube here or in the media player below. The Broadcast Film Critics Association (BFCA) and Broadcast Television Journalists Association (BTJA) on Monday announced the nominees for The 21st Annual Critics' Choice Awards, one of the precursors to the Oscars and Emmy Awards, and Alyvia Alyn Lind received a nod for Best Actress in a Movie Made for Television or Limited Series for her portrayal of young Dolly in Dolly Parton's Coat Of Many Colors last week on NBC. She faces off against Kathy Bates for FX's American Horror Story: Hotel, Kirsten Dunst for FX's Fargo, Sarah Hay for Starz' Flesh and Bone, Rachel McAdams for HBO's True Detective and Shanice Williams for NBC's The Wiz Live!, which aired the previous week in the same time slot as Dolly's biopic. The winners will be revealed live on A&E, Lifetime and LMN Sunday, Jan. 17. Travel review site TripAdvisor recently released its list of the best theme parks in the world based on user reviews, and Dollywood came in at No. 19, the park noted this week. The park's Smoky Mountain Christmas Fest continues through Jan. 3, including the final performances of Dollywood's A Christmas Carol featuring its Dolly hologram as the Ghost of Christmas Past before the show retires at the end of this season. A story about how Dolly splurged on her parents at Christmas was released Monday by Billboard magazine. Watch it here or in the media player below. Nearly a week after her appearance on NBC's The Voice, Dolly's presence is still being felt. Yahoo interviewed Emily Ann Roberts here over the weekend about being a finalist, and she talked about Dolly's comments on her performance of "9 To 5" on the show. In addition, Yahoo announced that her duet with mentor Blake Shelton will be a remake of Kenny & Dolly's hit "Islands In The Stream." Another Dolly appearance has been announced from her media tour last week: the syndicated program FABLife. Dolly's appearance (which I suspect is from the Coat Of Many Colors premiere red carpet) is slated to be broadcast on the show's Tuesday episode. Check local listings for times and stations. More than 13 million viewers tuned in for Dolly's Coat Of Many Colors Thursday night on NBC, making it the most-watched broadcast movie in several years. The project will stream for 25 days on NBC.com here, the NBC app and cable systems' On Demand channels. It is also available on Hulu here or in the media player above. Early ratings numbers estimated an audience of 12.8 million, but once all numbers had been counted and final ratings were released late Friday, that total had been adjusted to 13.03 million. That made the project the highest-rated movie on broadcast television in nearly five years, since Jesse Stone: Innocence Lost in May 2011. About 150 movies have aired on the "big four" networks in that time. Its 1.8 rating and 6 share with audience members age 18-49 won its time slot for the evening and made it NBC's most-watched program in that time slot since ER's series finale in 2009, also the network's most-watched scripted telecast since SNL 40 in February. The ratings are covered in Variety here. Thursday's part two of her Today interview is available here. Other coverage included a "B" review from Entertainment Weekly here, another very positive review from The Los Angeles Tmes here and a bad review from The Guardian here. Yahoo had a video of Dolly discussing her first Christmas away from home in 1964 here. Meanwhile, Country Rebel looked at the film's spiritual message here, and Country Weekly looks at her favorite Christmas memory here. Bustle looks at the film's accuracy here, while The Washington Times interviewed Dolly and Stella here, and Tupelo, Miss., station WTVA spoke here with a former Dolly classmate who recalled the first time she heard the song, saying she was driving on the interstate and when she realized what it was about she began sobbing and had to pull the car over because she knew it was true. Dolly's Blue Smoke gains one to No. 3 in the album's 79th week on the British country compilations albums chart, Friday's charts showed. On the same tally, Dolly's The Tour Collection re-enters the top 20 at No. 19, while Emmylou Harris' Original Album Series, Volume 1 (with two Dolly covers, one track with Dolly harmony and one track with Trio harmony by Dolly and Linda Ronstadt) dips one to No. 17. Dolly's Coat Of Many Colors premiere is here! NBC airs the project Thursday night. On Wednesday, Dolly's Imagination Library announced that her children's book based on the song will be added to the literacy project in 2017. And the film was all over the media on Wednesday. Taste Of Country shared a childhood story of lighting a bonfire to attract Santa's attention here. And interviews or reviews of the program appeared in The Huffington Post here, Patheos here, WBIR here, Biography here, FOX News here, Radio.com here, TV Insider here, The Washington Post here, The Toronto Sun here, Wide Open Country here, Closer Weekly here, The Fresno Bee here, The Boston Globe here, The Huffington Post here, The Observer Voice here and AOL here. Once Upon A Christmas, Dolly's 1984 holiday album with Kenny Rogers has seen a spike in sales last week, rising on the Dec. 19 Billboard charts released Thursday. The album gains five places to No. 7 in its 103rd chart week on the country catalog albums chart. The CD rises three to No. 37 Canadian albums and re-enters the catalog albums list at No. 33 and all-genre Hot 200 albums at No. 152. Its track "Hard Candy Christmas" by Dolly slips four on the holiday digital songs sales chart at No. 46. Country Faith Christmas, featuring Dolly's 1990 recording of "Joy To The World," rises five to No. 24 country albums in its fourth week. Rhonda Vincent's holiday collection, Christmas Time, with Dolly and several other guests on "The Twelve Days Of Christmas," falls off all of the charts except bluegrass, down from No. 26 country, No. 2 Heatseekersk, No. 21 Christian albums, No. 26 independent label albums, and Christian and gospel albums chart at No. 23 in its fifth week. Jewel's Picking Up The Pieces, with Dolly on "My Father's Daughter," rises seven on the folk albums chart to No. 14 in its 11th week. In its 19th week, Don Henley's Cass County, which features Dolly on "When I Stop Dreaming," gains one to No. 99 top 200, losing four to No. 59 current albums, 10 to No. 77 album sales, and holding steady at No. 11 country albums. Dolly appeared briefly on NBC's The Voice live elimination show Tuesday night to promote Thursday night's Dolly Parton's Coat Of Many Colors by spending a few minutes speaking to the semi-finalists about the music business, performing her classic song live on the program, and talking about the made-for-TV movie. Check out summaries of the episode from Extra TV here and Buddy TV here. Also watch Dolly's performance in the media player above or by clicking here. In related news, the project's costume designer explained to Yahoo why the movie coat looks different than the replica made by Dolly's mother for Dollywood here -- it was a decision from Dolly to make it "more vibrant, more colorful" for two reasons: one, the replica coat is old and faded, so the original would have looked brighter when it was made, and two, the story is told "from the child's eye," when things tend to look bigger and bolder than to adult eyes. The Clarion-Ledger newspaper in Jackson, Miss., spoke with executive producer Sam Haskell about the project here (which also revealed that Dolly's husband, Carl, is a big Ole Miss fan), and the cast and Dolly spoke with The Ft. Worth Star-Telegram here. Part one of an interview with Dolly from Dollywood and the DreamMore Resort that was taped a few weeks back aired on NBC's Today, and part two is scheduled for Thursday morning. Check out footage from that segment here. Finally, several reviews of the project were posted Tuesday, which seemed to agree that the dialogue is cheesy and sounds like a Hallmark greeting card, and the film is corny and sentimental throughout, but it succeeds in being heartwarming and touching the audience. Variety said here it should attract a large audience; The San Francisco Chronicle said here the film "may be poorly made, but it will warm your heart for a couple of hours. Heaven knows, we certainly need that right about now;" and Media Post said here: "Still, there are worse things you can watch on TV than 'Dolly Parton's Coat of Many Colors.' Despite its shortcomings, its heart is in the right place." Taste Of Country shared a video of "11 Unforgetable Dolly Parton Moments" on Tuesday. Watch it here. Pop icon Cyndi Lauper recently recorded a country album in Nashville, noting she felt Dolly's presence was over the recording sessions because the hotel where she stayed featured the phrase "What Would Dolly Do?" above the artwork. Kind of in Dolly's honor, she covered The Best Little Whorehouse In Texas score song "Hard Candy Christmas," which Dolly performed in the film adaptation of the musical and had a top 10 hit with at that time (a recording that has become a perennial holiday favorite). Take a listen to the cover here. Dolly stuck around for most of the show Monday on The Hallmark Channel's Home & Family, being interviewed, doing a cooking segment, a make-up segment, and a DYI segment, all to promote her NBC movie Dolly Parton's Coat Of Many Colors on Thursday night. Watch her appearance online on the network's website in several parts starting here or repeating on TV at noon Tuesday. On The Voice, Dolly didn't appear on Monday but Team Blake contestant Emily Ann Roberts performed "9 To 5." Dolly stops by the show on Tuesday night to mentor the semi-finalists and perform her own "Coat Of Many Colors." Several of the movie's actors were interviewed on Louisville's WAVE here. Dolly will still be on NBC's Today Tuesday and Thursday as well as Access Hollywood on Wednesday. Lily Tomlin has renewed hope for a 9 To 5 reunion on her Netflix show Grace and Frankie with Jane Fonda. Asked by Logo's New Now Next here about the prospect, she replied: "Everybody has been after us for that. Jane and I think we've devised a way to get her into the third season without putting too big a�9 to 5�imprint on it." The show is currently in its second season. Dolly pal and Trio partner Emmylou Harris was among the guests for Rufus and Martha Wainwright's holiday concert in Montreal on Sunday, which was taped by the CBC for future broadcast, and she chose to perform Dolly's "Coat Of Many Colors" for the program. Read more from The Montreal Gazette here. Grammy nominations were released Monday, and while Dolly did not garner any nods this year (even for her recent collaborations with Jewel and Don Henley), Rhiannon Giddens did score a nomination for Best Folk Album for her Tomorrow Is My Turn featuring a cover of Dolly's "Don't Let It Trouble Your Mind." The broadcast premiere week for Dolly Parton's Coat Of Many Colors has arrived! In advance of Thursday night's airing on NBC, Dolly will be all over. During the weekend, coverage included a review of the film � three out of four stars � from The St. Louis Post Dispatch here, interviews with Dolly from The New York Post here and Sioux City Journal here, a longer preview video from Stars Entertainment here, an interview with several Haskell family members here. Dolly also appeared on CMT's Hot 20 Countdown with an interview viewable here and in the media player above (they also have an extra clip on the CMT app that did not air). As was previously reported, Dolly appears on The Hallmark Channel's Home & Family Monday morning (with a noon Tuesday repeat), NBC's The Voice Tuesday night, NBC's Today Tuesday and Thursday mornings, and the syndicated Access Hollywood on Wednesday. Down Under, The Essential Dolly Parton falls back off the top 40 Australian country albums chart this week, down from No. 25 in its 86th chart week. The promotional tour to plug Dolly Parton's Coat Of Many Colors for next week's NBC broadcast continued on Friday with a Dolly interview appearing on Parade magazine's website here, along with a sidebar on her philanthropic work here. Ole Miss-affiliated Hotty Toddy profiled the project due to alumni Sam Haskell's involvement here, and a producer spoke with The New Albany Gazette here. In addition, the new issue of Nash Country Weekly hit newsstands with a festive holiday Dolly on the cover to promote the picture with the title "Growing up Dolly" and the description: "Singer, musician, actress�Dolly Parton has worn many hats in her iconic career, but her most famous piece of clothing is her coat of many colors, a story she will bring to life in a new television movie airing Dec. 10 on NBC." Yes, the digital release of several classic Dolly albums was moved up a week and took place on Friday instead of the originally-planned Dec. 11. Available now are 1967's Hello I'm Dolly, 1971's Joshua, 1977'sHere You Come Again and 1984's Rhinestone and The Great Pretender (marking the first time any of the five titles has been available for download, and each has also been out of print as CDs for many years) in addition to the 10-album "digital box set" The Collection. Dolly's Blue Smoke holds steady at No. 4 in the album's 78th week on the British country compilations albums chart, Friday's charts revealed. On the same tally, Dolly's The Tour Collection falls back off the top 20, down from No. 11, while Emmylou Harris' Original Album Series, Volume 1 (with two Dolly covers, one track with Dolly harmony and one track with Trio harmony by Dolly and Linda Ronstadt) re-enters the top 20 at No. 16. Burt Reynolds was interviewed on BBC Radio 2 Thursday by Dolly fan Kylie Minogue and asked about working with her, to which The Express reported here that he joked: "I loved it. It was wonderful. I've got to work with her for so long that eventually I was looking at her face." The NBC film Dolly Parton's Coat Of Many Colors had a "Hollywood premiere" at Grauman's Egyptian Theatre in Los Angeles on Wednesday night, generating a significant amount of press for the project, which gets its broadcast premiere on the network next Thursday night. Dolly told Entertainment Weekly here and People here that she and sister Stella, who acts in the movie, had a private screening the night before to watch it and cry together before the more public showing with the cast and guests. Coverage of the premiere includes a gallery of photos courtesy Gary and Larry Lane here (including the image at left, Thanks, guys!) as well as stories from (many featuring video) Starts At Sixty here, The Daily Mail here, Access Hollywood here, AOL's The Boot here, Reuters wire service here and Extra TV here. The Tennessean posted a Q&A she had with the Nashville Songwriters Association about the song here, her official website posted cast interviews from the picture here, and CBS highlighted her interview Thursday on The Talk here. Don't forget Dolly's 10-album "digital box set" The Collection comes out from Sony's Legacy imprint on Friday including Hello I'm Dolly, My Blue Ridge Mountain Boy, Jolene, Love Is Like A Butterfly, The Bargain Store, All I Can Do, New Harvest, First Gathering, Here You Come Again, Heartbreaker and 9 To 5 And Odd Jobs. Buy the set for download here! In addition, Amazon on Thursday night seemed to indicate that the anticipated Dec. 11 release for several individual digital titles may also be moved up to Dec. 4 for Dolly's Hello I'm Dolly from 1967, Joshua from 1971, Jolene from 1974, Here You Come Again from 1977, Rhinestone from 1984 and The Great Pretender from 1984. A new preview video of NBC's Dolly Parton's Coat Of Many Colors was released on Wednesday. Watch it in the media player above or by visiting Dolly's official Facebook page here. Dolly was expected to make an appearance Wednesday night on CMT's Artist Of The Year ceremony, where frequent duet partner Kenny Rogers is being honored with a lifetime achievement award. No word as of press time whether her appearance at the live event, starting at 8 p.m. Eastern time on the cable network, was to be in-person or via video. The Salt Lake City Tribune on Wednesday offered a profile on Dolly impersonator Jason Cozmo. Take a read here. Yet another Dolly appearance to promote NBC's Dec. 10 premiere of Dolly Parton's Coat Of Many Colors was announced on Tuesday: she will mentor the network's semi-finalists on The Voice next week and perform "Coat Of Many Colors" live on the Tuesday night telecast of the program. Dolly's official website, DollyParton.com, on Tuesday revealed a contest to win several prizes for a Smoky Mountain vacation to promote the movie: a tour of Dolly's actual Tennessee Mountain Home, a $1,000 gift card, four Dollywood season passes, three nights at the park's DreamMore Resort, four tickets to Dixie Stampede, four tickets to Lumberjack Adventure, a complete Imagination Library book set and "Coat Of Many Colors" merchandise prize pack. Enter here through Dec. 31 by sharing an essay or photo of what "Coat Of Many Colors" means to you, by Tweeting about the song with the hashtag #CoatSweepstakes or posting your favorite memory to Instagram using #CoatSweepstakes. Dolly spoke with The Express in England about the project here. And YouTube entertainment channel ScreenSlam on Tuesday offered several behind-the-scenes interviews with the cast including one with Dolly here or in the media player above and with Alyvia Alyn Lind�here, Ricky Schroder�here, Mary Lane Haskell�here, Jennifer Nettles�here and Stella Parton�here, plus B-roll here. Once Upon A Christmas, Dolly's 1984 holiday album with Kenny Rogers, may have seen its annual peak on the country catalog albums chart, dropping three spots to No. 12 in its 102nd chart week on the tally, down from its one week this year in the top 10, the Dec. 12 Billboard lists confirmed. The title moves up 10 places to No. 40 Canadian pop albums, while its track "Hard Candy Christmas" by Dolly rises two on the holiday digital songs sales chart at No. 42. Country Faith Christmas, featuring Dolly's 1990 recording of "Joy To The World," jumps 10 to No. 29 country albums in its third week, slipping one to No. 22 Christian albums, gaining one to No. 24 Christian and gospel albums and rising five to No. 14 compilation albums. Rhonda Vincent's holiday collection, Christmas Time, with Dolly and several other guests on "The Twelve Days Of Christmas," apparently sees a big sales jump, as it is this week's Hot Shot Debut on the country albums chart at No. 26, while shooting up 19 places to No. 2 Heatseekers and 27 spots to No. 21 Christian albums, debuting at No. 26 independent label albums, re-entering the Christian and gospel albums chart at No. 23 and staying at No. 2 bluegrass albums in its fourth week there. Jewel's Picking Up The Pieces, with Dolly on "My Father's Daughter," inches up one on the folk albums chart to No. 21 in its 10th week. In its ninth week, Don Henley's Cass County, which features Dolly on "When I Stop Dreaming," declines three to No. 100 top 200 and No. 55 current albums, nine to No. 67 album sales and one to No. 11 country albums. Two additional Dolly television appearances have been added to promote her NBC project Dolly Parton's Coat Of Many Colors airing next week, it was announced on Monday. In addition to her two appearances on NBC's Today that had been reported here last week (7-9 a.m. period Dec. 8 and 9-10 a.m. period Dec. 10), she will be on CBS' The Talk Dec. 3 and Hallmark Channel's Home & Family Dec. 7 and 8. (The announcement from her publicist doesn't specify, but Hallmark repeats its previous day's episode of the series at noon the following day, so presumably she's only making one appearance on Dec. 7 which repeats 26 hours later on Dec. 8.) She also chatted wth Channel Guide Magazine about the film here. Dolly fans in Indianapolis have scheduled their fifth annual Dolly Birthday Party! This year's event, to celebrate the big 7-0, takes place three days before her actual birthday. The 1 p.m.-5 p.m. Jan. 16 gathering at Forty Five has a suggested $10 donation at the door to benefit anti-bullying charity Angels & Doves and is sponsored by Smirnoff Vodka and Jodie Chandler, Realtor. Dolly-themed cocktails, prizes and live performances are promised. Tell them you're coming on Facebook here and click on the poster at left for a larger view.